Many people arrive for a session feeling nervous, wondering how the session will unfold and just what will happen, when really, there is nothing to be concerned about. The first part of the session is a simple consult of questions and answers – rather like an easy chat with a friend. Following your initial consultation, we will move into a short session to “Crush your Cravings”. This will eliminate you craving for the foods and/or drinks that you know you should avoid, but you find you just can’t. It may even be just the size of the helpings you have. This exercise is essential to put you “ahead of the game” by changing your attitude to how and what you eat. Generally the innovative method used to “Crush your Cravings” is only needed once and is part of your first consult only. However, if we find it would be beneficial to repeat the process we will include in future sessions. Next follows the hypnosis. This involves sitting comfortably in a recliner and simply listening along to the restful sound of your therapist’s voice. You will not feel zoned out, zonked out, spaced out or ‘under.’ Most times you will not even “know” you are being hypnotised. It’s all rather “normal” feeling. You will simply feel relaxed, comfortable and at ease. At the end of the session the most common reaction is for clients to open their eyes and say “Wow! That was wonderful! Thank you.” Eyes sparkling from a radiant face, looking relaxed, rejuvenated and revitalized, most clients comment on how they cannot remember the last time they relaxed that deeply or felt that good. 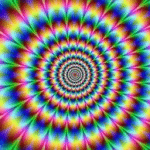 Hypnosis is typically a wonderful, gentle, relaxing experience. At no time are you ‘under’ or ‘out of control’. 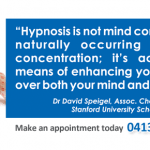 Contrary to popular myths, hypnotherapists do not have the power to ‘control’ their clients. We are simply trained in the latest, most cutting-edge techniques that work with the mind to bring about the results you want. My Perfect Image therapists are kind, caring, compassionate people who want to help you achieve your weight loss goals. They will always work with you in a gentle, caring and respectful manner. At the end of your Hypnotic Session, you will be given your “Homework” and your “My Perfect Image Construction Kit”. This is your Kit to start building the Image that is just Perfect for you. Your Kit contains all the tools you will require to start construction immediately. Here is a bit more information from Joslyn explaining what is going on for you when you are battling the ‘weight’ and feeling like you can never win. What does it feel like to be hypnotised? – Does it feel good? Being a natural state of relaxation and because the client at all times retains control, it is perhaps one of the safest forms of therapy. 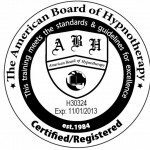 There is no documented evidence of any one ever being harmed by hypnosis. No, hypnosis is not dangerous. It is just a natural state of the mind utilised by the hypnotist for purposes of entertainment (as they do on stage – remember you have to be willing) or to help the individual change certain habits or pattern of behaviour. The mind has natural defenses built in which will automatically reject any suggestions it deems harmful. Can the hypnotist make me do things against my will – like in the movies? No! A hypnotist can not make you do anything against your will, morality, values or ethics. What you have seen in the movies is fantasy. A hypnotist can not call you up on the telephone and order you to rob a bank or murder someone (unless you already wanted to do that.) Your mind has natural defenses against harmful suggestions. It will always protect itself. The therapy consists of four sessions, over ten to twelve weeks with each session supported by a “take home CD” and is tailored to each individual client. Using a combination of hypnotherapy, NLP and cognitive behavioural therapy you will find your eating habits change and you lose weight permanently and naturally. Your desire to exercise will increase and you will find that you love to eat health, fresh fruit, vegetables and lean meats in portion sizes that will attain and maintain the Perfect Image for you. By using our Hypnotic Gastric Band system we create in your unconscious mind a state where you will believe you actually have a Gastric Band fitted! You will eat smaller portions and feel full. Our Hypnotic Gastric Band System is the long term solution to your weight problems. In your second Hypnotic session we take you through the process of having a gastric band fitted, But only in your unconscious mind. By using suggestion and visualization your unconscious mind will be convinced that your stomach has become smaller and therefore you need less food. You will find yourself full quicker and by eating less and less at each meal you will begin to lose weight. We will guide you in suggestions of how to structure your smaller meals so that you maximise the speed of your weight loss. The process uses hypnotherapy and cognitive behavioural techniques to help you achieve your ideal weight – and stay there! Your first hypnotherapy session will be approximately 2 hours and each following session will last for around 90minutes. 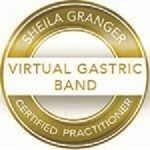 Virtual Gastric Band hypnotherapy has been used in the USA, U.K. and Europe since 2007 with extremely successful results. There are many Universities conducting clinical trials on this procedure, and to date all recorded results are proving show outstanding long term weight loss. What else can hypnosis be used for? confidence, improve sales ability and memory retention. Practically any bad or destructive habits or behaviours can be removed via hypnosis. It can help ease fears and phobias, improve relationships and communication – the list goes on and on.